This banner is inspired by textile banners created for the International Ladies' Garment Workers' Union in 1911, and carried in a public funeral march and protest by the union in the wake of the Triangle Factory Fire that killed 146 young, mostly Jewish and immigrant women workers. Windows, doors and fire exits were kept locked by the factory owners, trapping workers when the fire broke out. Today, garment workers continue to perish in factory fires, especially in Bangladesh. 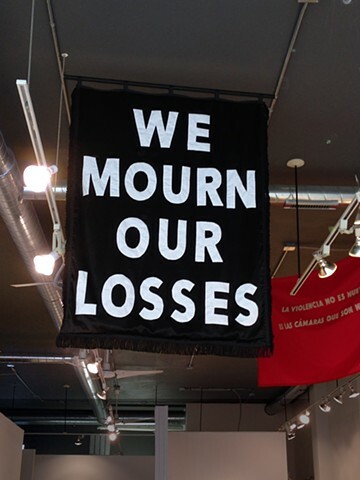 The original banners, captured in a handful of archival photographs, read "Workers Mourn Our Loss". This banner, part of the larger series New Demands?, is adapted from that slogan. On the one hand, the use of the plural "losses" alludes to the many losses experienced by workers in the USA and around the world. On the other hand, the work reflects on numerous other types of contemporary losses: the loss of Black lives to police brutality and murder; the loss of reproductive freedoms, abortion rights and rights to health care; the loss of dozens of Chicago public schools in economically disadvantaged, primarily Black and Hispanic neighborhoods; and the absence of community members (again mainly in the African American and Hispanic communities) imprisoned in large numbers for minor drug and economic crimes, thereby decimating families and entire communities. The text has been adapted from "We Mourn our Loss" to "We Mourn Our Losses" to acknowledge a trajectory of historical and continuing losses that are cumulative, choking, and overwhelming. Exhibited as part of I Can't Breathe at ARC Gallery, Chicago. Juried by Mary Patten and Romi Crawford, PhD.